What is top coating? 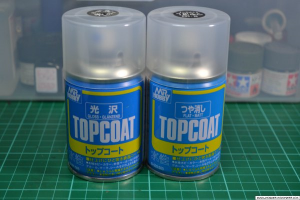 After assembling, painting and detailing your Gunpla model, you can use top coating to help protect it. Top coating is a method wherein you use a clear colored paint to seal in and protect whatever surface you are applying it on, and it is actually used in car manufacturing to help give cars a glossy finish. 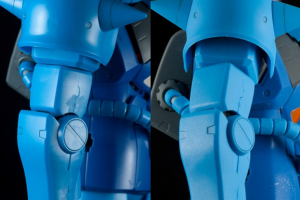 Therefore, you can imagine that a Gundam top coat is much more than a protective measure; when properly applied to your Gunpla, it also brings an extra aesthetic touch in either gloss, matte or even in-between. Note: Due to international shipping restrictions, FROM JAPAN cannot complete overseas shipments of paint or aerosol cans. 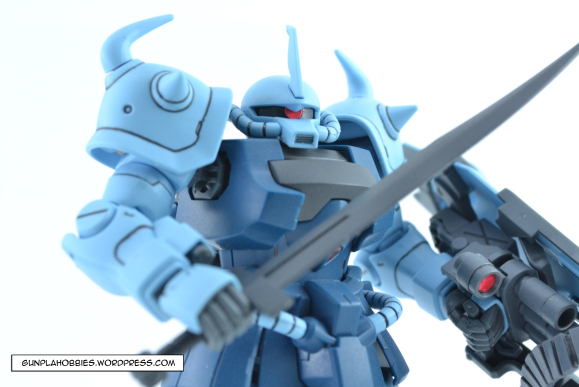 Mr Hobby is the most popular brand for top coating Gunpla. They basically come in three types: Flat/Matt, Gloss and Satin. They come in small cans and can usually accommodate 1 to 2 1/144 HG models, or 1 1/100 MG model depending on how much you are using. 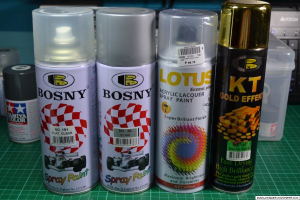 Also available are industrial paint can brands like Bosny, Lotus and RJ London, which provide clear coating. They are cheaper compared to the Mr. Hobby line and actually have more volume, hence the bigger cans. They can usually accommodate up to 3 or 4 1/144 HG kits, or around 2 1/100 MG kits. The disadvantage of using industrial paint cans is that, due to their larger spray nozzles, the paint particles will be larger; you will therefore have to adjust the spray distance to your Gunpla model. Later we will talk about how to spray paint onto your Gunpla model. 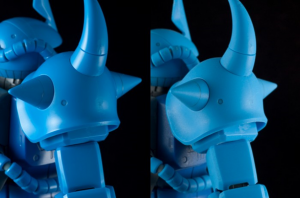 CAUTION: If you choose to use industrial spray cans for top coating Gunpla, please be careful: Spraying too much onto your Gunpla model can make the plastic material brittle, possibly breaking it in the future. This is important especially in older models. Why use top coat spray? 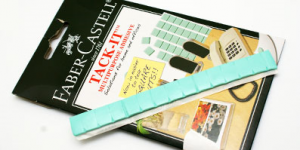 – It can help seal in the underlying paint job and detailing that you did on your Gunpla model. Also, applying top coat following a paint job helps to prevent accidental smudging or erasure of panel lining. 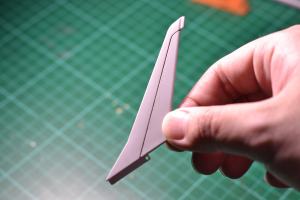 – In addition, if you choose to use a flat/matte top coat, there’s no need to worry if you have a lot of scratches from sanding your Gunpla model; you can make the small, minor scratches from sanding and cleaning practically disappear. – Gloss top coat can be used after painting your Gunpla model with your desired color, but before applying decals and panel lining. Why? Because panel lining is best done on a smooth glossy finish! When applying decals, especially water slide decals, keep in mind that they adhere better to a smooth glossy finish, just like panel lining. You can always spray top coat matte/flat afterwards if you want a final matte/flat look rather than a glossy finish. Finally, a good Gundam top coat can prevent your model from looking like an ordinary plastic toy; it not only makes it look more realistic, but quite simply, much cooler! 1. Top coating Gunpla is basically a nine-step process. First, prepare to spray your Gunpla model. Make sure that all panel lining and decal application is finalized before starting. Also confirm that there is no dust on the surface of your model or else it will get trapped during the application process. You can use a camera lens blower to blow off dust. 3. 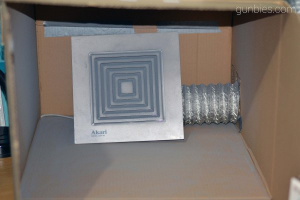 If you really want to spray indoors, either buying or creating a spray booth so that you can reroute the harmful fumes outside the room is probably the best option. 4. After preparing your Gunpla model, set up a flat, even surface (A small table or platform) where you can place it in order to spray. Don’t forget to put newspapers on it to keep it clean! 5. 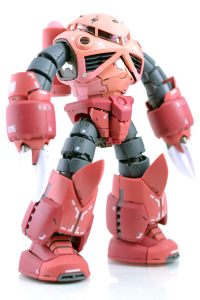 You can spray the individual sections of your Gunpla model one by one, but it takes more time, energy and spray paint to do and makes little difference compared to spraying the whole model all together; you can use some simple techniques to help properly cover all the essential parts of your model. 6. You can use sticky tacks to secure your model on your chosen table/surface. 7. Now it’s time to spray! Always shake your can before each and every burst, holding the spray can upright as much as possible. Never begin by spraying directly onto the model itself. Instead, aim for the empty space to the left of your Gunpla and spray from left to right, stopping only at the empty space to the right side of your model. Just as you should not start by spraying your model directly, you should also never stop spraying while aimed directly at it. This left-to-right spraying motion, started and stopped to either side of your model, prevents excess paint as well as paint dripping woes. 8. Do this from top to bottom until the front is complete. Then move on to the back of your model, repeat the process, and do the same for the left and right sides. After doing all of that, wait for around 5 minutes to allow the initial top coat to dry. Then you can spray another coat of top coat spray on all sides again using the same technique and process. 9. You can spray up to around 3 coats for maximum effect. After spraying your final coat, let it sit overnight (around 24 hours) to let the top coat fully cure. 10. And that’s it! 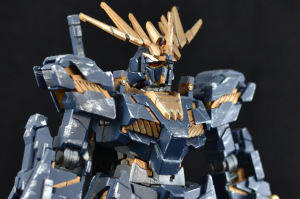 After completing this process, your Gundam top coat should be properly top completed to your satisfaction! – Remember to have proper ventilation when spraying! Health is more important than anything! – It would be preferable to buy some industrial goggles in order to protect your eyes. – If you have an airbrush kit and compressor, you can use that to topcoat your Gunpla. *We cannot ship the products to overseas*. 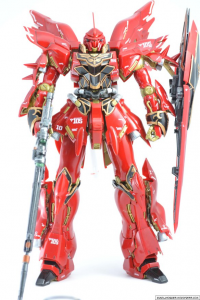 However, you can get your favorite supplies to help with top coating your Gunpla on FROM JAPAN. You can also create your own Gunpla top coat mixture; simply google to find out more about homemade top coat mixtures. – To optimize spray particles, just dip the spray can in warm water before spraying; the resulting finer particles are better for creating multiple even coats. – Don’t spray on animals! – Spray products are extremely flammable! Be very careful not to spray near open flames, flammable items or areas that are prone to static electricity such as cold, carpeted rooms. – Store the spray products in a cool, dry place, away from sunlight and your pets, too! – Dispose of the spray cans properly when empty! Do not put them into fire or anywhere flammable! Find a proper disposal station in your local community, and enjoy painting your Gundam top coat to perfection without accident or injury.